Saturday it was rainy and cold but today it ended up being sunny, dry and about 62F (16.7C). Bookman had the day off too so we made the most of it. We finished digging up the rest of the veggie bed extension that had been covered in black plastic all winter. Let me just say how great the whole black plastic thing is. It killed the grass completely which made digging it out so much easier. It is still a bit of work but not as much as it is breaking up and digging out live grass. So, finished that. Then planted shelling peas, snow peas, beets, kohlrabi, radish, lettuce, spinach, corn, pak choi and mustard greens. The rest of the seeds will go in next weekend most likely. So exciting! We finished installing the rain barrel too. We started that about two weeks ago and found we needed a few things we didn’t have and Bookman’s drill wasn’t charged. Then the weather turned bad and we weren’t able to finish until today. It’s supposed to rain Wednesday/Thursday so we are ready! We figured out where we are going to put our herb spiral but didn’t have the energy to start it yet. We also figured out where the raised beds for the blueberries are going but didn’t start building them yet because the drill needed charging after the rain barrel/gutter work. One of the blueberry beds is getting slightly altered and enlarged from the planned 3X3 feet (just shy of a meter on each side) size because we are also going to plant a huckleberry bush. Let me explain how that happened. I’ve been doing lots of reading about permaculture and Bookman and I had a discussion about what we wanted our backyard garden to be. We decided no grass, as low maintenance as possible, and as many edibles as we could cram in. This all fits with permaculture perfectly. Permaculture is also know as edible forest gardening and there are seven layers. Because we have a small backyard we are starting with the second layer, small trees (the first layer is very tall trees). Walter (crab apple) and the honeycrisp cover that. The third layer is shrubs. Here is where we are going wild and what brought us to the huckleberries. The length of our yard runs east to west. We will have along the north edge of the yard in an east to west line broken by an ornamental trellis that has a climbing rose and a couple of clematis, what Bookman has dubbed, a “berry-er” since on the other side of the berry-er is our neighbor’s yard. Along the berry-er we are planting two blueberry bushes, a huckleberry bush, thornless blackberries and a bush cherry. There will be another bush cherry but it is going in a different spot. Since huckleberry bushes also like acidic soil, it made sense to expand one of the raised blueberry beds to include it. This is going to be so much fun! This coming Friday is the big plant sale we always go to every year where we will be purchasing all our berries. I will take a photo for you next weekend after we get them all planted. The herb spiral should be done then too. And the fountain we bought. It’s been sitting in its box in the house because it is ceramic and the instructions with it say it can only go out after danger of frost is past. Since May 10th is our average last frost date, we’ll get it going next weekend. In the meantime, the forsythia has burst into yellow bloom, a few crocuses are blooming, and the apple trees (Bossy and Bingo in the frontyard, Walter and Honeycrisp in the backyard) all have little leaves starting to pop out on them. Even though we had a bit of snow on Friday, it is nice to feel like spring really is here. Bookman and I have scheduled ourselves a three-day weekend coming up because of the plant sale. Sale is Friday and then the weekend is garden, garden, garden! The forecast at the moment is saying cool and dry. Good gardening weather. Sylvia, weeding and mulching in the fall makes spring start off so much easier. One day I won’t have a big spring garden project planned and I will get to be scandalously lazy. I like your idea of no grass in the backyard and low maintenance. That’s exactly what we want and we are sort of working on our backyard but it’s hard! You’ll definitely have to post pics of the plants you find at the plant sale! Iliana, thanks! since we don’t have kids and no longer have a dog and Bookman hates mowing the thought of getting rid of all the grass makes him smile. You are right though, getting there is a lot of hard work! It all sounds so exciting. I wonder if huckleberries would grow in Scotland, I suspect they need heat as I’ve never heard of anyone growing them here. I’m looking forward to your next instalment! pining, I bet they would. The shrubs are North American natives and the variety I am planting is native to my region which means they can tolerate being buried in snow and temperatures to -34C (and probably colder). From what I can determine, they are very similar to blueberries so if you can grow blueberries you could probably grow huckleberries too. Well done Stefanie … some great planning I can see. I do like Forsythia. We had one here but the soil probably wasn’t good. The natives have survived but it didn’t … they do grow here though so I’m tempted to plant another one one day. 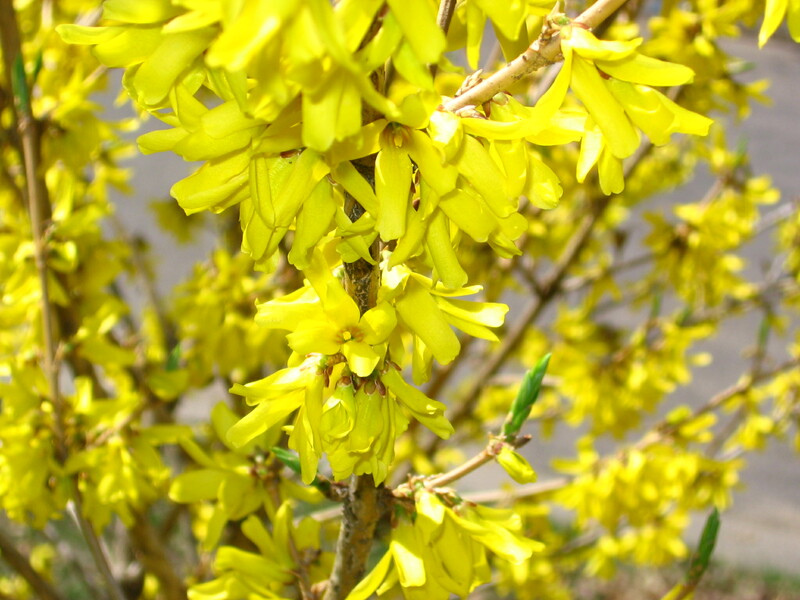 whisperinggums, forsythias are great because they bloom so early and give a nice bright flash of color to the garden before there are many other things blossoming. Too bad yours died. I think they are worth trying again! Yes, I think so too … We had one in our previous home that did better. I think it was location. You know what they say, location, location, location! Oh yes, location can be everything! Your garden sounds lovely. I like the beautiful / edible combination. I don’t think I’ve ever eaten a huckleberry, although my parents talked about gathering them wild as children. I only have a tiny patio crammed with five pot of hollies and azaleas. But we planted a Winter King hawthorn in our street tree pit and it’s currently blooming like crazy. We’re proud and delighted that it’s doing so well in it’s very first year! Joan, thanks! I’ve never had a huckleberry before either but there they were in the catalog and I figured, why not? We tried growing holly here a number of years ago but between the cold and a nasty hailstorm, the poor things didn’t make it longer than a year. Your hawthorn sounds gorgeous! You are getting on a treat! You must have been exhausted after all that planting, though – it always seems like sticking a few seeds in the ground will be a breeze, but ha! no, it is tough work in fact. Hope you got to relax with your books afterwards, content in the knowledge of a job well done. Litlove, oh are my gardening muscles ever sore! Bookman’s too. We’ve been waling around and groaning ever since Sunday night. We’ll feel better again just in time for Friday when we will get sore all over again! Ohhhh, I LOVE huckleberries! I’ve only ever had them while camping as a kid -we used to pick them from the trails but never got more than a cupful. And maybe once or twice huckleberry pie in the small town my dad grew up in. Sounds like my kind of garden! Jeane, so glad to hear that! I have never had any that I can recall but just the idea of them seemed so much fun I couldn’t resist giving them a try. I intrigued by the black plastic technique for killing gras. We need to dig up a patch that is so weedy it’s a mess. When do you put the plastic down. How long does it take? kheenand, we put ours down in September/October and left it all winter and early spring but you can also put it down now and the heat of the sun should have everything cooked in about 6-8 weeks.